25 years of product management, marketing and consulting experience. Bachelor’s from IIT, Bombay and M.S. in Management from Sloan School, MIT. Doctor of Science in Mechanical Engineering from MIT, Cambridge Mass. 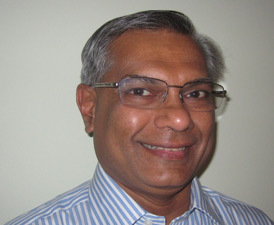 As Executive Director, Raj develops the Foundation’s strategy and efforts to encourage entrepreneurship and innovation. He helped launch the Dunin Deshpande Queens Innovation Center at Queens University, Canada; the Gopalakrishnan Deshpande Center at IIT Madras; the Pond Deshpande Center for Innovation and Entrepreneurship at the University of New Brunswick, Canada; and, as Board Chair, helps direct the strategic direction of the Entrepreneurship for All Center in Lowell that has launched 400+ startups since inception. He has launched the Deshpande Symposium, an international conference of over 100 universities and colleges sharing best practices in innovation and entrepreneurship. His 25 years of product management, marketing and consulting experience include serving as Vice President, Product Management for nTAG Interactive, spun out of the MIT Media Lab; V.P. Product Management and Marketing, and later V.P Client Services, at mobile software vendor Vaultus, another MIT spinoff (now part of Antenna Software); Sr. Director, Product Management at Be Free Inc. (now Valueclick), the earliest pay-per-click e-commerce company; and launching two leading edge servers at Electronic Book Technologies (later acquired by Inso), a pioneer in internet content management cited as inspiration for the World Wide Web. His early career included setting up consulting practices at Microsoft Corp., Digital Equipment Corporation, and Booz Allen & Hamilton. He is an active member of TiE Boston and the India Society of Worcester and co-founded the TIE Social Entrepreneurship Group and the annual Forum for Social Entrepreneurs. He has been a judge for several entrepreneurial efforts such as the Canadian Technology Accelerator, MassChallenge, MIT 100K, the MIT Legatum Center, the MIT Global IDEAS competition and the Harvard President’s Challenge. He has spoken at, organized and moderated numerous panels on social entrepreneurship and mentors several startups. Raj has a Doctorate and a Master’s degree from MIT, a Master’s from MIT’s Sloan School of Management and a Bachelor’s from the Indian Institute of Technology, Bombay.